Well. Mr. David Maier has outdone himself. This is not going to be a "build review," as I did not photo-document the build. To say that following the instructions was imperative would be understatement. To say that craftsmanship and attention to detail was important would be the least I could say. 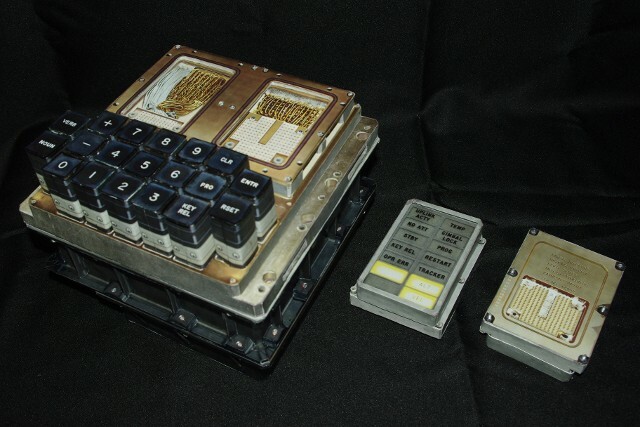 BUT, the results are a phenomenal, full-size replica of the Apollo Guidance & Navigation Computer Display Keyboard, or "DSKY" for short, as it appeared in Lunar Module #5 - the Eagle. 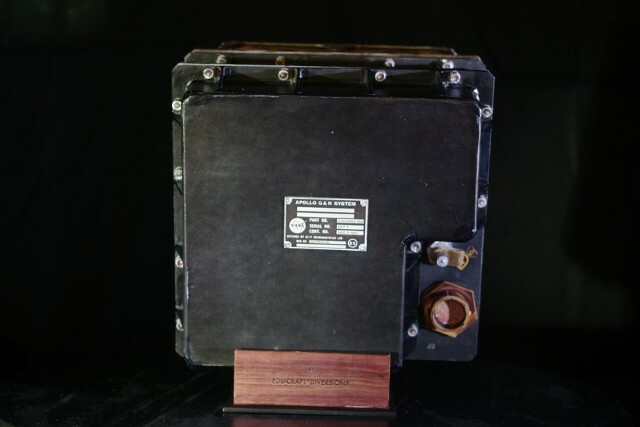 The LM that took Neil Armstrong and Edwin Aldrin to the Moon on July 20, 1969. 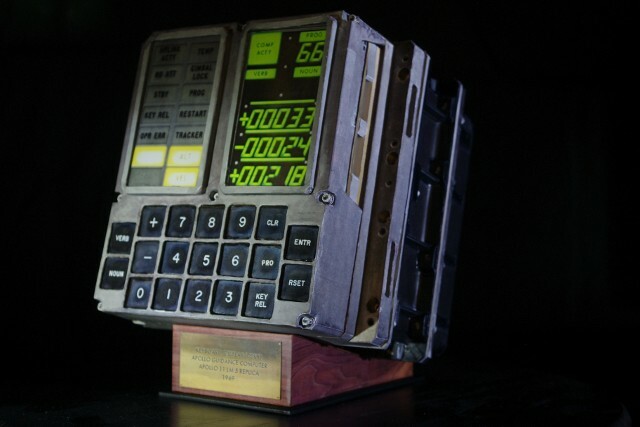 The primary DSKY model was completed on July 16, 2013 - the 44the anniversary of the launch of the flight of Apollo 11. Tonight, I have completed the display stand provided with the model and have photographed it in its final form. I regard this as a "joint effort," because without David's amazing skill at artistic rendering, these models would not exist. It was a labor of love to put this one together. The only items not made of 60 pound-stock printed paper or corrugated cardboard (for structure and support) are the two fascias over the display areas, which are 0.010" thick clear plastic, held by formed paper frames. The model is intended to "break down" into its component sections. 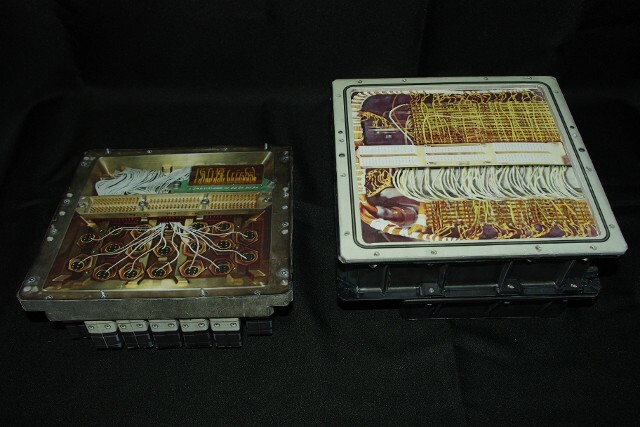 The long "screws" used to secure the Front Cover to the Front Section were fabricated by winding thread around round toothpicks, sealed with white glue and painted. 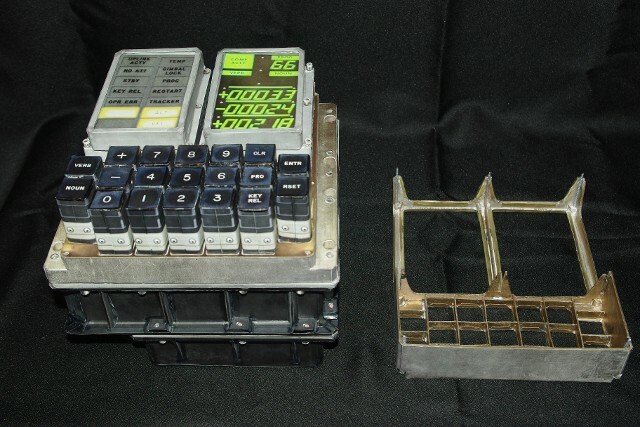 The short hardware used to hold major sections of the DSKY together were made from actual nylon screws, cut down to serve as "press-fitted" fasteners. 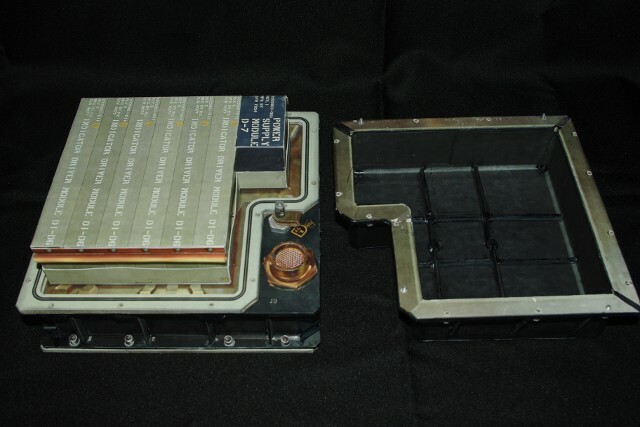 These hold the Front Section to the Main Housing, the Display Modules onto the Front Section, and the Rear Cover onto the Main Housing. I took a bit of liberty in the fastener area, as making all of the screws from toothpicks became problematic, as I could not get the consistency I wanted. I also found that four of the cut-down nylon fasteners would hold the sections together quite well, so it was not necessary to do every single one of the screw locations. 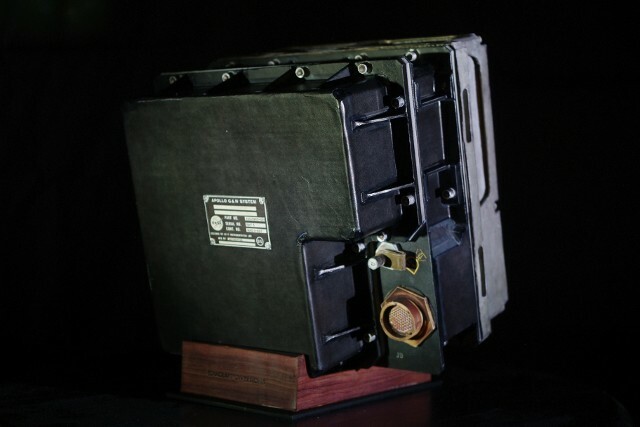 All of the external "screw heads"are fabricated from printed paper cylinders, with end covers and multi-layer "washers" underneath. Anyway, there's far too much detail to go into, so we'll stop here. 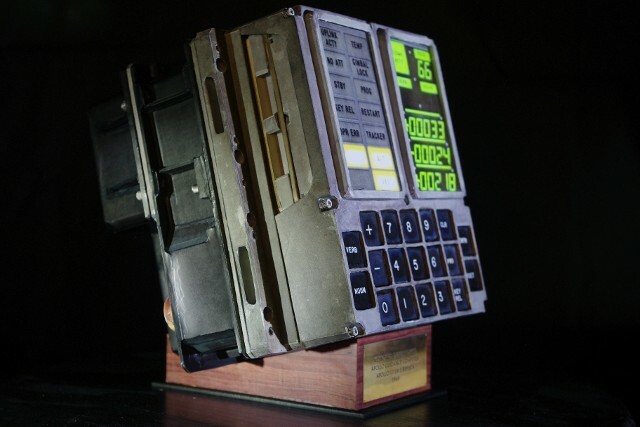 The model depicts the point in LM5's descent when Armstrong punched up P66 and began the manual flight over the rock field, with 33 fps horizontal velocity, descending at 24 fps vertical velocity and an altitude of 218 feet, showing on the DSKY. For more photos of the model, description and pricing, please click here to go to the Edu-Craft website. 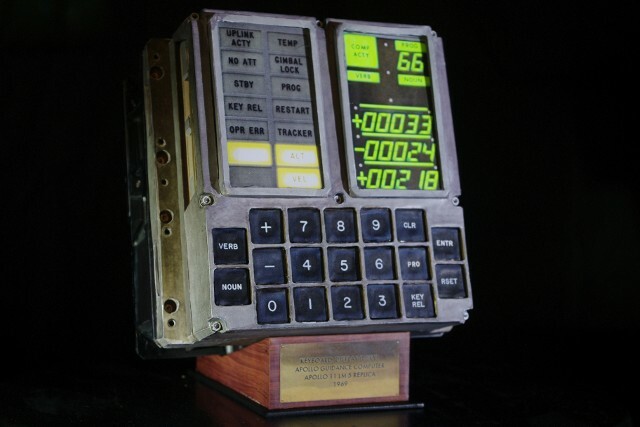 This particular copy of the Apollo LM5 DSKY model was presented to Col. Edwin (Buzz) Aldrin Jr. by David Maier and myself, in honor and tribute to the Lunar Module Pilot of the historic Apollo 11 first Lunar Landing mission. 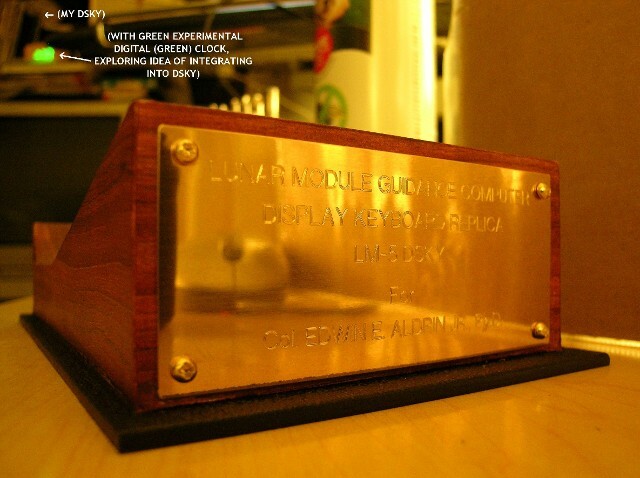 The base of the DSKY was fitted with a specially-made plaque, placed on the base by David Maier, Edu-Craft Diversions. 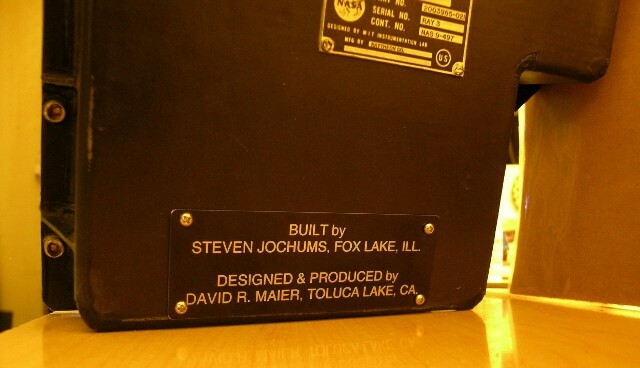 The back of the DSKY also got a special plaque. 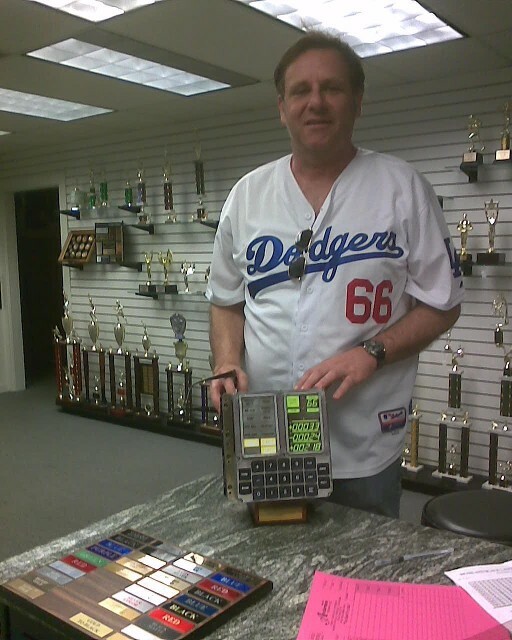 David with the model at the trophy shop who did the engraving. From here, into the box and off to Col. Aldrin's Office. The LM 5 model did in fact make it into Buzz’s office and he currently has it on display there. When he took a close look at the model he began to take himself back to the thought process of running the device and it is always noticed when he has a guest over for a meeting. 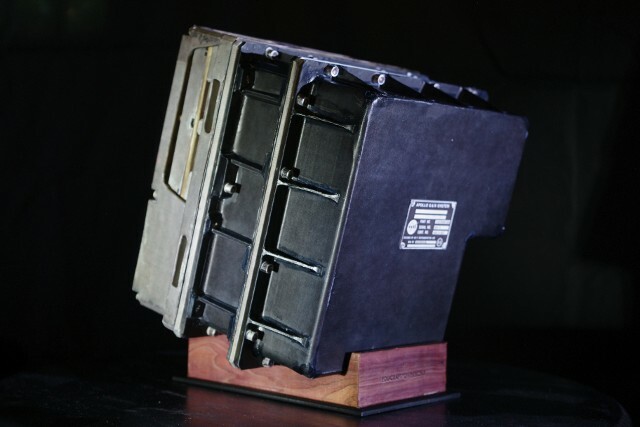 For more information about the DSKY of the model, full description and pricing, please click here to go to the Edu-Craft website.